A Northland dairy owner yelled "get ready to die" as he chased away four men who tried to steal from his store. 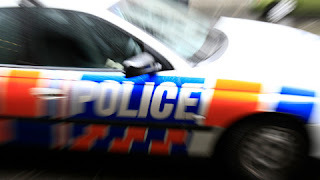 The owner was armed with only a broom as he ran at the men - one of whom was armed with a crowbar - at the Kingsway Dairy in Hikurangi, north of Whangarei, yesterday afternoon, Radio NZ reported. The owner, who did not want to be named, told the Herald he had no sympathy for people who tried to rob from him, and had no qualms putting his own life at risk to stop it from happening. He said the men - three of whom have since been arrested - entered his shop while he was cleaning and "donged me on the head and pushed me". "There were four people that came into the shop and I don't know what they were after, I didn't give them time to talk even, I just gave them a bit of action and when they were running away I threw the board on the front windscreen and the windscreen shattered." The man said he saw the men sitting in their vehicle outside the shop for about five minutes before the incident happened and knew they would be trouble. "They came inside the shop and I saw them and one of them just donged on my head with a crowbar and I said 'hey' and I pushed them and they pushed me. I was so angry with them, I just said 'come on boys, get ready to die', because I'm ready to die as long as they're ready to die. As long as I can defend myself I have no sympathy, I'm sorry." The man said he had owned the dairy for 13 years and attempted robberies happened "all the time". "I don't put up with all that sort of nonsense, not in my world and I don't want them to do community service. I'm going to tell police their punishment should be hard." He suggested the offenders be dumped miles out at sea and left to try and swim back into shore. "If they swim, they have a life, if they don't, then too bad ... I don't want them getting just two years or five years jail." Northland police are investigating the incident. The dairy owner said he was phoned last night and told three of the four offenders had been arrested, however, the fourth was still being sought, along with the blue vehicle. Anyone who may have seen people acting suspiciously in the area of King St, Hikurangi, yesterday afternoon is asked to contact Northland Police on 09 430 4500 or they can call Crimestoppers anonymously on 0800 555 111.